The terms used to be synonymous. If you said you had a SATA 3 SSD drive it was also assumed you knew what your protocol was. We are currently on the cusp of two inflection points in the SSD market. The first is a protocol change from SATA to PCI-Express; as data, this is not something you can see directly. The second is the change in physical connectivity. Instead of just the common SATA connector, we now have several different connector types, with each offering their specific benefits. The physical connector is the interface between your SSD and motherboard or notebook, whereas the data protocol is the method with which they talk to one another. In most people’s minds this is what an ‘SSD’ is. It predominantly comes in 2.5 inch variations up to 1TB, but this capacity barrier is regularly increasing. Connectivity and protocol is uniformly SATA III up to 6Gbit/s (which equates to around 550MB/s in the real-world) and it enjoys the maximum compatibility across all notebooks. Due to the requirement for a PCI-Express connector, these are exclusively used in PCs. Usually they require 2x or 4x PCIe slots, but some server/professional versions offering top-level performance and features beyond gaming/desktop use or require even larger 8x slots. PCI-Express SSDs are attractive because they break the boundaries of SATA III’s 550MB/s. The 4X PCIe is certainly desirable, but until recently it has been the option of those using the Desktop/Server form factor. The mSATA (mini-SATA) interface appeared briefly in a generation of M-Tech notebooks. mSATA SSDs follow the SATA specification, offering a maximum performance of 6Gbit/s and look much like mini-PCI-Express devices, but the two connectors are not inter-compatible. mSATA is being phased out and replaced with the better designed M.2. M.2 SATA SSDs perform up to SATA III speeds (6Gbit/s); the same as other SATA-based SSDs. The benefit is the space saving factor which allows for more features or a larger battery, but as we see the performance factor is largely unchanged from the 2.5” SATA form factor. While M.2 PCI-Express uses the same PCI-Express protocol as SATA Express, it drops the ‘SATA’ namesake to avoid confusion. M.2 PCI-Express is set to be the interface of choice for M-Tech Laptops, with its small form factor and 10Gbit/s performance potential (in the first generation). The chart attached shows the impressive performance gain by using the new M2 PCIe 4X SSD. One drive M-Tech is particularly fond of is the Samsung XP941 M.2 PCIe in 128GB, 256GB and 512GB. So, you want to toss your SATA III SSD into the trash right now and go out and purchase a new M-Tech Laptop with M.2 PCIe SSD right? What are your options? The current models featuring the new M2 are the M877/M875 and the M4K, both new models to the M-Tech product line. As the year progresses, the long standing M-Tech product line-up will upgrade from the current generation of mSATA to the new and insanely fast M2 in both SATA and PCIe X2 and X4. Which M2 drive do we like the best? M-Tech carries several varieties, and each has its reason for being on our option list. 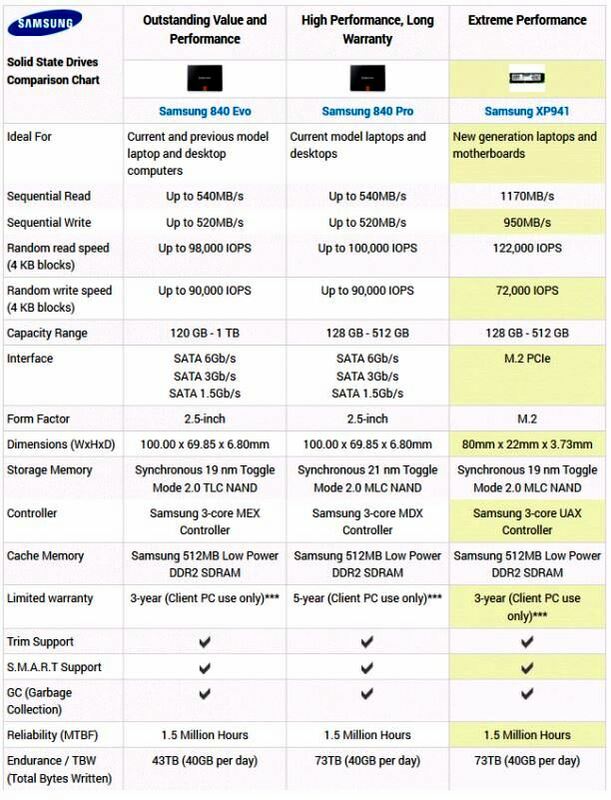 However, if we were forced to choose, it would be the Samsung XP941 M.2 PCIe SSD. This is one of the few drives available that boasts sequential read speeds of up to 1,170 MB/s and sequential write speeds of up to 950 MB/s. The XP941 is advertised as having 4K random read (QD=32) performance of up to 122,000 IOPS, and 4K random write (QD=32) performance of up to 72,000 IOPS.